Award-winning fiber artist Shelley Hoist is preparing for two prestigious juried art shows on the mainland this year. The first one is the American Craft Council Show Aug. 8-10 in San Francisco, a three-day celebration of all things handmade in the Festival Pavilion at Fort Mason. More than 225 of the top contemporary jewelry, clothing, furniture, and home decor artists from across the country gather under one roof for the largest juried craft show west of the Rockies. Hoist then returns Sept. 5-7 to the Western Design Conference in Jackson, Wyoming, where her work won an award last year. With more than 115 exhibitions on display at the Snow King Center, the artists are selected by a jury of design experts and are rigorously challenged to create their best work as they compete for limited invitations to showcase their pieces at the Western Design Conference. This show celebrates those who have chosen to forgo mass production in order to create one of a kind, museum quality functional art pieces that bring the spirit of the West into the mainstream marketplace. Hoist will present her Hawaiian Paniolo inspired series. Using the sheath portion of naturally fallen leaves from various types of palms found on the big island, Hoist’s pieces resemble leather, wood or fabric and bring texture and organic art into a home or business. 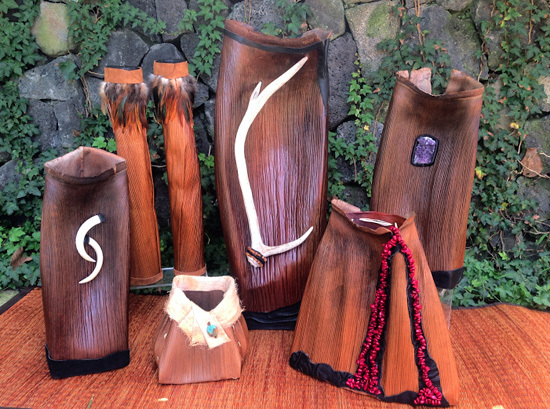 Hoist’s work can be purchased at Holualoa Gallery, Kohala Mountain Gallery and at the monthly Kokua Kailua Village Stroll. The American Craft Council is a national, nonprofit public educational organization founded in 1943 by Aileen Osborn Webb. The mission of the Council is to champion craft by promoting an understanding and appreciation of contemporary American craft. Programs include the bimonthly magazine AMERICAN CRAFT, annual juried shows presenting artists and their work, a leadership conference, the Aileen Osborn Webb Awards honoring excellence, workshops, seminars and a research library. The Western Design Conference Exhibit + Sale, sponsored by Mountain Living magazine, brings together crafts people, scholars, interior designers, architects, fashion designers, and collectors of all ages with a shared interest in the West.